Brussels, being in close proximity to many European countries remains the typical cultural mixture in Central Europe. Bearing Hispanic, French and Dutch influences to its architecture and several romantic impressions as well, Brussels, the capital city of Belgium has managed to retain its own flavour whilst being serenaded by several traditional impacts. It is thus, a must-visit destination with its several museums, landmarks, parks and the picturesque countryside. 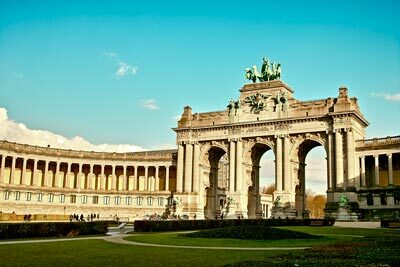 With our reliable car hire services, you can hope to tour Brussels and indulge in some great sightseeing. Constructed during the 1958 Worlds’ Fair, the Atomium is a spectacular iron structure resembling the atomic composition of Oxygen with its atoms and covalent/ionic bonds being depicted by gigantic bridges and spheres. There are several attractions and entertainment zones present within the spheres. Moreover, the view of the skyline from the highest tower is breath-taking. You can easily reach the Atomium if you choose a car rental. From the musical instruments of the past to the ultramodern infrared microphones, you can find each of them prominently displayed in the Musical Museum of Brussels. Extending to four floors and exhibiting musical instruments from various parts of the world, this is your chance to find out what a Tibetan temple bell or the exotic Indian sarod looks like. Visit many more such famous museums in Brussels with our superb car rentals. The Brussels Bourse is a fascinating building with an age-old history associated with it. Currently occupied by the Brussels Stock Exchange Companies, the structure was once a plush convent, christened the Les Recollets, which got destroyed due to a natural calamity. Though most of the building is now renovated, the underground portion remains an excavation site and houses the famous Bruxella 1238 museum to display the remains of the convent and its relics. This old-fashioned beer manufacturing site is one of Brussels best attractions. The beer made is completely natural and only organic grapes fruits are processed to make the famous (non-sweetened) sour limbic and geuzue, both of which are served complimentary when you tour the brewery. The ambience resembles that of a museum and the manicured lawns around the brewery make it a picnic spot. Situated in the charming countryside of Gaasbeek, this magnificent palace is a wonderful building and is inducted in the National Heritage Site List. Coming to this village and touring the castle seems like being in one of Bruegel’s paintings; indeed, several of his famous pictures were painted here. For more of these sites and other places in Brussels, book a car rental service with us and you will not be disappointed. Driving around in the city of Charleroi Airport with a rental car can be a hassle but not impossible. Its a good way to move around but we advise to have a look at the local traffic rules as they may vary with what you are used to. Take in mind that in rush hour traffic can be pretty dense and it can take longer before you reach your destination. Last month, the average car rental length at Charleroi Airport was 3 days. The average rental car length at Charleroi Airport is 5 days. The most booked rental car type currently at Charleroi Airport is ECONOMY cars. Last year, the most booked rental car type at Charleroi Airport were ECONOMY cars. How much does it cost to rent a car at Charleroi Airport? Last month, the average car rental price was 128 USD. Last year, how much did it cost to rent a car at Charleroi Airport? Last year, the average car rental price was 139 USD. What is the current average daily price to rent a at Charleroi Airport? Last month, the average rental price was 43 USD per day. How much did it cost to rent a car at Charleroi Airport over the past 12 months? Last Year, the average rental price was 30 USD per day. The car rental companies available at Charleroi Airport are: . See below last 5 customer reviews. Our customers rated Charleroi Car Rental with an average of 9.33 based on 3 ratings. Rented a car from europcar. rncar was excellent, but had ugly damage on front and back, you would think that they would have the repairs done before the rent it out.rnfrank. I would really like somebody to wait for us on the morning of the car return.